Quality Education is a right of every child. While the term quality can be interpreted in different ways, proven methodology and educational philosophy like Montessori System of education can work wonders anywhere in the world irrespective of the social background of a child. After having worked in schools from cities, semi-urban and rural areas for several areas now, we are completely convinced to take this wonderful philosophy of education to rural areas. Starting Montessori Resource Centres is our first step towards taking Quality Education to children in villages. A resource centre is a place where children spend their time in a meaningful way. Unlike play-way method, a Montessori resource centre starts teaching life skills to children at a young very age to make them feel confident about themselves. The methodology adopted is scientific in nature where fun is quite natural rather than imposed. A trained adult takes care of the holistic development of every child in the environment. A child who comes to a resource centre, experiences freedom with responsibility and is also provided with adequate opportunities to reach his/her full potential. These resource centres provide education of the contemporary kind, relevant and holistic starting with the toddler age groups who will attend Montessori sessions along with their parents. On completion of 3 years of age, they will continue in a primary Montessori classroom in the same premises. The group of children and families will continue to grow with us in our efforts to plant progressive education and responsible living. The next plan is that, it will expand to be a centre for community dialogue and development as well. From our past experience, we have developed a model that works with all stakeholders in a child's education, in order to make learning useful and a lifelong experience for the entire community. We have started two model Resource Centres in two different districts in Tamilnadu. In Vallambedukkupam in Gummidipoondi Taluk, Thiruvallur District. Write to us at relieffoundationindia@gmail.com to know more about this project and how you can be part of it. Every child comes into this world with a definite purpose. Seed for that is sown at home. Joining hands with the home, a school is a place that nurtures it and provides the necessary care & protection. In time, community or the society as a whole reaps the benefits. A well nurtured seed grows healthily into a tree and serves countless purposes. On the other hand, a neglected seed either does not grow or does not reach its full development. Every child is awaiting to unveil his/her potential hidden within. A school has to be a Happy Place for children to feel wanted and respected. The environment needs to be inviting and the adults should play constructive roles. Several years of our work in the field of children's rights and rehabilitation have come in as a learning for us to evolve a model of education that serves the whole child. When such an education is being offered, the families are able to feel the emergence of a new human being in their child. They attain a state of peaceful living after several years of such an initiative, that it sows the seed for community building and responsible citizenry. We are now in a position to offer evidence based training information to schools which are keen to become a hub of learning and social reform. Our time tested culture of learning embedded in the Montessori philosophy has raised the happiness index of children in schools that we have had the opportunity to field test it. This is evidenced in the following ways. This is achievable provided the school management believes that a happy school is a fundamental right of every child. 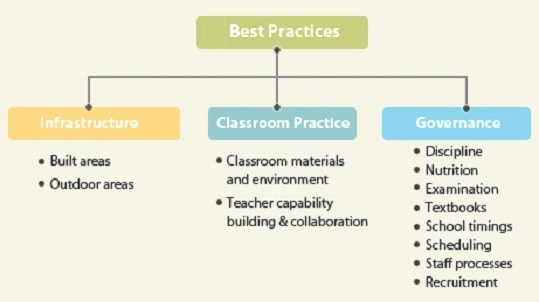 Our approach leverages our expertise in teacher development and classroom practices. We provide services to new and existing schools that are committed to improving learning processes and environments. Our recommendations are based on certain fundamental principles that view children as capable learners and members of a school community that respects their needs. Solutions for education or school reform need a sign in from the management with a vision for the school. A layered approach is discussed to set expectations and a timeline. Relief Foundation starts with Child Rights Compliance Audit as a first stage which later could involve implementing of the Happy School Programme provided schools are willing to enter into an agreement on its logical installation and completion which may last from a few months to a few years. The Happy School program consists of a continuous engagement with team members from our Resource pool for the allocated period of time as stakeholders in the improvement process of the school. The primary goal of establishing Resource Centers is to help prepare students to live and work in a world that increasingly calls for self- reliance. In light of the very real and pressing problem of quality teachers, centers of this kind equip students with necessary skills by providing opportunities for self - determined, discovery-based education. Resource centers are multi-functional in nature. They house learning materials that are developmentally appropriate thereby enabling children to learn at their own pace while providing the necessary cognitive stretch. Apart from enriching the school curriculum, the resource center is a useful community resource as a library, a computer centre, a nodal training centre for teachers from various neighboring areas, and a space to conduct adult literacy and skill development programs. In its nascent stage, Relief Foundation's Children's resource centre contained all of kinds of material that would generate interest and attention in children. We served children from a few local government and private schools to gauge their interest and study the utilization. Over time, after our foray into the Montessori arena, we factored in all concepts that contribute to the development of child through age appropriate environments and facilitators. Started in the year January 2011, CASCADE Montessori Resource Centre serves as a unique model of cooperative learning where parents participate in the learning process of their children. We have brought groups of children whose families have chosen to help them in their meaningful education with an increased stake. Each group has children from various economic strata and equitable education is provided, helping children and families understand the stages of learning and developmentally appropriate education practices. 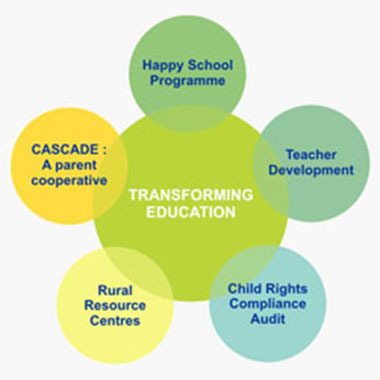 If you want to spend some time and understand how these centers can benefit schools (teachers, students) or your child please visit our Resource Centre - CASCADE - in Besant Nagar, Chennai.